Criticizing media coverage of the Northern Pass Transmission project, the International Brotherhood of Electrical Workers says it is starting a daily blog to report a “balanced” look at the ongoing Site Evaluation Committee hearings, but wouldn’t say Wednesday night who is writing it or funding the effort. InDepthNH.org has done the most news coverage of Northern Pass, reporting on every adjudicative hearing, but IBEW Local 104’s business manager Brian Murphy didn’t respond to an email asking if the criticism is aimed at InDepthNH.org or the New Hampshire Union Leader, which has also actively covered the hearings, or both. IBEW is an intervenor in the Site Evaluation Committee hearings and has testified in favor of the proposed 192-mile transmission project from Pittsburg to Deerfield to bring Hydro-Quebec power to the New England grid. IBEW Local 104 members will construct the majority of the Northern Pass transmission line, according to Murphy. “Unfortunately, the voices we hear in the media are too often skewed toward the anti-project perspective, and many New Hampshire citizens aren’t getting the information they need to have a truly informed perspective on this project. InDepthNH.org stands by its reporting as fair and accurate. IBEW Local 104 statement by Brian Murphy, Business Manager: Now that the Northern Pass is into the final stretch of the regulatory approval process at the Site Evaluation Committee (SEC), it makes sense that the project is getting a lot of coverage in the news media, and that supporters and opponents are making their voices heard. As a matter of fact, I think many Granite Staters probably have a basic familiarity with the project since it has been going on for so long and it gets covered so much. Unfortunately, the voices we hear in the media are too often skewed toward the anti-project perspective, and many New Hampshire citizens aren’t getting the information they need to have a truly informed perspective on this project. That’s why the International Brotherhood of Electrical Workers (IBEW) Local 104 is announcing a new blog that will keep the public informed about the Northern Pass and the regulatory approval process at the SEC. Our new blog will be published after every SEC meeting, of which there will be more than two dozen before the end of 2017. We will share a balanced look at the day’s proceedings, including a summary of the testimony presented by the project’s supporters and its opponents. With so much at stake with this project, it is very important for the public to have access to the complete story. The IBEW supports the Northern Pass because the project will create thousands of jobs for local workers and lower the cost of energy for every Granite Stater, all while protecting our environment and our scenic views. As a matter of fact, the federal Department of Energy recently released its final Environmental Impact Statement (EIS) for the Northern Pass, in which they call the Northern Pass the “preferred alternative,” including the so called “no-build” alternative and numerous alternate configurations. Yet despite our union’s testimony at the SEC and a favorable EIS, local media coverage is dominated by misleading statements and cherry-picked coverage. The public deserves to know the truth about the Northern Pass. New Hampshire citizens, especially residents of the North Country, should be able to get the full story about the benefits and impacts of the Northern Pass. Each and every SEC session is chock full of detailed information that everyone should have access to in order to be fully informed about the project. For example, the October 16th SEC meeting included a discussion on visual impacts in which SEC members learned more about the differences in criteria used by the project’s developers and its opponents in determining what should be considered a “scenic resource.” This discussion gets at some of the core misunderstandings people have about the project’s impacts, and whether criticisms of the project’s visual impact mitigation are unfair. It seems to me that a full reading of today’s hearing would lead most reasonable people to believe that the visual impacts of the project will fall well short of the “unreasonably adverse” standard, which is what the SEC must find to issue their approval. But this level of detail and context is often not present in media reports, so interested citizens aren’t able to hear the full story. We believe sunshine is the best disinfectant, so we will do everything we can to shine a light on the Northern Pass and the SEC process so that every Granite Stater can fully understand the benefits and impacts of this project, as well the ins and outs of the regulatory approval process. The public deserves to have all the available information at their fingertips, and that’s exactly what we intend to provide. Brian Murphy is Business Manager of IBEW Local 104, a labor union based in Barrington, NH. 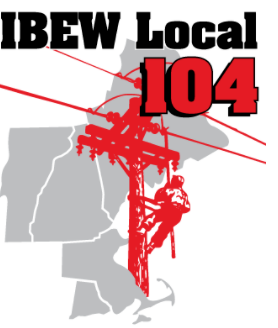 IBEW Local 104 members will construct the majority of the Northern Pass transmission line.